Monsters, Inc. is finally getting a follow-up, but not for the big screen. It isn't one of those straight-to-DVD Disney sequels like Mulan 2 either - Monsters at Work is coming to the Disney+ streaming service as a new series in 2020. Lead actors Billy Crystal and John Goodman will return as Mike and Sulley, the lovable monster duo who previously starred in Monsters Inc. and its prequel Monsters University. According to Disney, Monsters at Work will take place six months after the events of the original film. 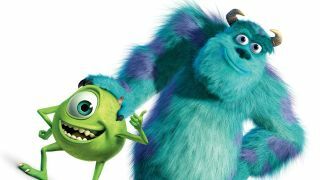 Spoiler warning for an 18-year-old movie, but the ending to Monsters, Inc. signalled a massive change in monster society: Mike and Sulley discover that children's laughter is a much more powerful source of energy than their screams, and Sulley even takes over as CEO of Monsters, Inc. It sounds like Sulley's stepped down from his executive role: a new Monsters at Work character, Ben Feldman as Tylor Tuskmon, is a young mechanic who "dreams of working his way up to the Laugh Floor to become a Jokester like his idols Mike and Sulley." Other additions to the cast include Kelly Marie Tran as Tylor's lifelong friend Val Little and Aisha Tyler as his mom Millie. Henry Winkler (AKA The Fonz) will also join in as "scatterbrained boss" Fritz. After watching Winkler as Arrested Development's utterly incompetent attorney Barry Zuckerkorn, I'm 100% on board with the idea of him playing a flighty monster boss. Disney+ is set to launch later this year, which means Monsters at Work won't be part of its initial lineup, though Disney has confirmed that the streaming services' content will be broken down into five hubs: Disney, Marvel, Star Wars, Pixar, and National Geographic. So you can expect Monsters at Work to live alongside Toy Story, The Incredibles, and the rest of its Pixar cousins whenever it arrives. You don't have to wait to enjoy the highlights from our latest video Release Radar. Once you're done watching that, check out our guide to all the new TV shows coming in 2019 and beyond.